Aerial photographic work by Toby Driver of the RCAHMW in the dry summer of 2006 led to the identification of a considerable number of new crop mark sites. Eight of the crop marks were curvilinear ditched enclosures on Llŷn that were likely to be prehistoric defended settlements. A previous phase of the project successfully carried out geophysical survey and soil pit assessment of a number of defended enclosures and a similar approach was adopted for these sites. The work was carried out in partnership with the RCAHMW who supplied the aerial photographs and plots. Surveys were carried out at the following seven sites on Llŷn: Bwlch y Ffordd Isa, Llannor (SH 40213967), Maesoglan Farm, Buan (SH 29703791), Cwmistir Uchaf, Nefyn (SH 25093926), Penybryn, Botwnnog (SH 24763461), Pont Rhyd-Hir, Llannor (SH 34663558), Cae Newydd Mynachdy, Botwnnog (SH 22593178) and King George’s Field, Efailnewydd (SH 35283584). Permission was refused for survey of one of the crop mark sites and so a similar crop mark enclosure on Anglesey, Ynys Bach, near Llanerchymedd (SH 445825), was surveyed as an alternative. This had been identified by local aerial photographers John Rowlands and Dafydd Roberts. 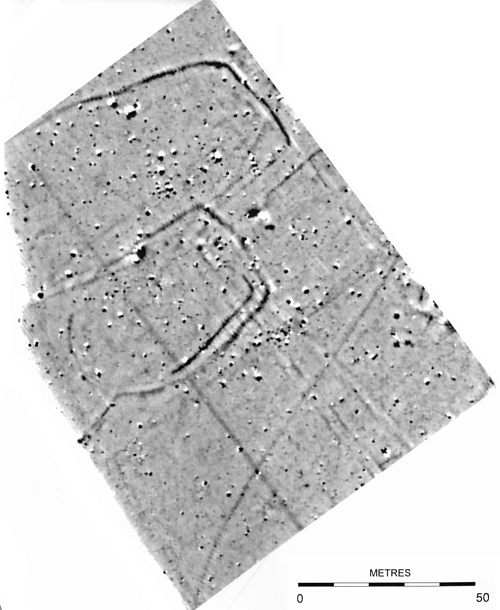 The geophysical survey and soil pitting results were generally complementary with the aerial photographic evidence. The gradiometer detected ditches where parching had not occurred and the aerial photographs showed the line of the ditches where factors such as magnetic bedrock had obscured archaeological anomalies. Enhancement could be seen to occur within several of the enclosures, producing a general elevation in magnetic noise at Ynys Bach along with more discrete areas of enhancement at four of the sites that appear to indicate the presence of hearths and other debris on the floor levels of roundhouses. The eight enclosures can be divided into two groups: firstly possible Late Bronze Age/Early Iron Age enclosures, secondly enclosures of broadly Iron Age type. 1. The first group comprises the enclosures at Maesoglan and Cae Newydd Mynachdy which fall into the class of possible second or early first millennium ‘concentric enclosures’. A very slight ditch and possibly another outer concentric ditch were identified at Maesoglan. 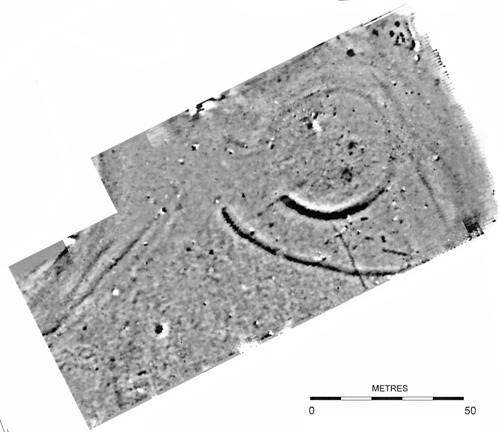 The survey at Cae Newydd Mynachdy detected a single ditch with one central roundhouse. 2a. Compact sub-circular enclosures with houses detached from the enclosure walls, but not set specifically central to the enclosure. This type includes Bwlch y Ffordd Isa, Cwmistir Uchaf, Penybryn and King George’s Field. These enclosures are close to circular and distinctively neatly laid out. Roundhouses were identified at Bwlch y Ffordd Isa and Penybryn. Possible antennae ditches were detected at Bwlch y Ffordd Isa and Penybryn although both seem likely to be late additions and not part of the main design. 2c. Enclosures of compact form with the house walls coeval with the enclosure bank This type of enclosure is represented only by that of Ynys Bach which can be characterised by the fact that it has a substantial bank and the main house that appears to have its wall built into the bank. This type of settlement is likely to be of Late Iron Age/Romano-British date, belonging to the same class as ‘Courtyard house’ settlements. The work also comprised an element of public outreach in which trial excavation was carried out at one of the sites with arrangements made for guided visits and talks for local schools.